Three months ago, Goldman first among the big banks warned that the US fiscal trajectory was dire, warning that "US fiscal policy is on an unusual course" with the budget deficit expected to widen over the next few years, as a result of prior imbalances and recently enacted policies - namely Trump's dramatic fiscal stimulus - which should lead to a federal debt/GDP ratio of around 85% of GDP by 2021. 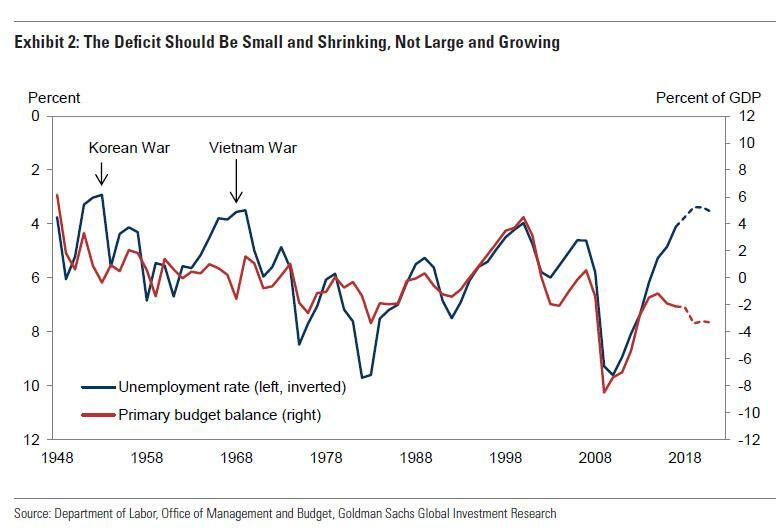 This, Goldman's economists warned, stands in contrast to the typical relationship between the economic cycle and the budget balance, as shown in Exhibit 2, which shows that the US deficit should be small and shrinking, not large and growing at this stage in the business cycle when the unemployment rate is near its cyclical lows. ... we project that, if Congress continues to extend existing policies, including the recently enacted tax and spending legislation, federal debt will slightly exceed 100% of GDP and interest expense will rise to around 3.5% of GDP, putting the US in a worse fiscal position than the experience of the 1940s or 1990s. The bank's conclusion in February was just as dire: "the continued growth of public debt raises eventual sustainability questions if left unchecked." Of course, "sustainability questions" is a polite bank euphemism for economic and financial catastrophe. All else equal, Goldman's distressing forecast sees US federal debt rising to 105% of GDP in ten years, a whopping 9% higher than CBO’s latest projections. Congress agrees on a deficit reduction package similar to the major deals of the early 1990s. 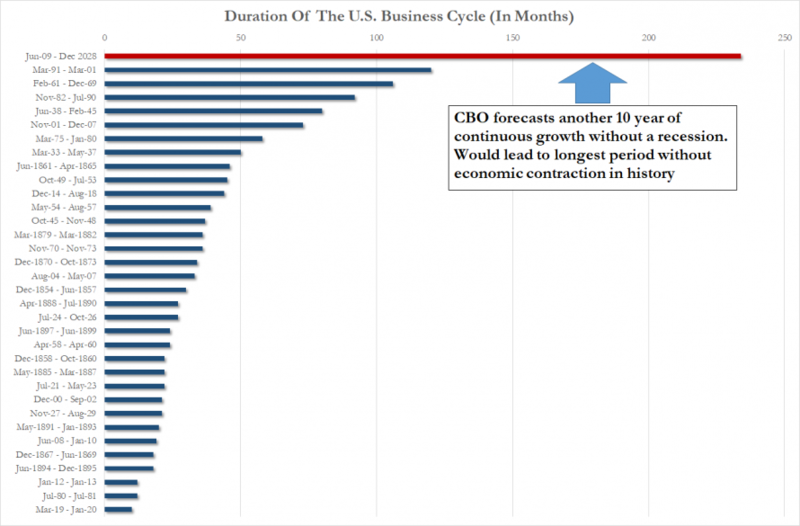 Of course, while nobody wants to say it, the recession scenario is a guaranteed on as otherwise the US would have been in an expansion for nearly 20 years, or 234 consecutive months by December 31, 2018, as we calculated one month ago, with the laughable pro forma result shown below. A recession, as Goldman points out, would obviously widen the deficit and boost the debt/GDP ratio more than any of our other scenarios over the next few years. However, as report author Alec Phillips warns, "over the next ten years the outlook is worse under a low-growth scenario or continued fiscal laxity." 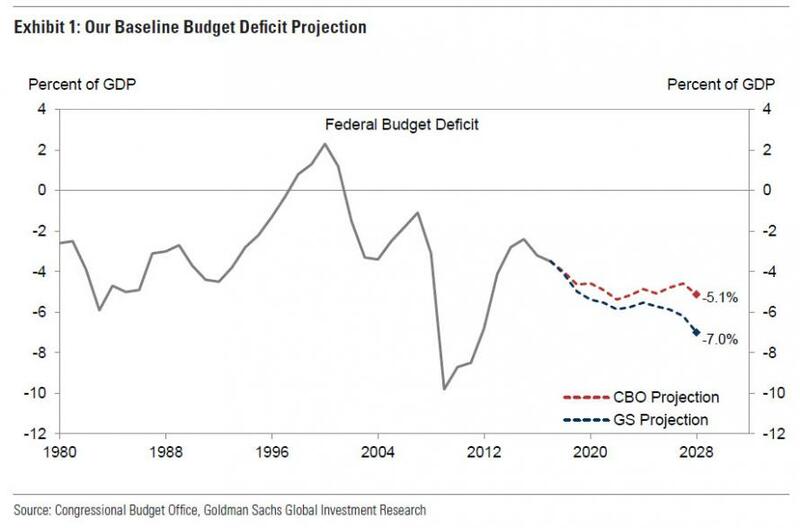 And while a recession is a given, if nobody wants to admit it, Goldman points out that the "most striking scenario" would be the most optimistic one, where Congress enacts a deficit reduction package as large (as a share of GDP) as the largest two deficit reduction packages of the early 1990s. What is especially concerning, is that even under this best case scenario, with a budget-friendly assumption, "the deficit and debt level would still reach around 5% and 95% of GDP respectively, very close to CBO’s baseline forecast for 2028." What does all this mean in practical terms? Adding soaring deficits to rising rates, and an exponential debt issuance calendar, and you get a very troubling outcome: much higher rates, at least in the beginning, as eventually the stock market will crash, and trillions in capital flows will once again flee stocks for the "safety" of US bonds, fiscal crisis be damned. 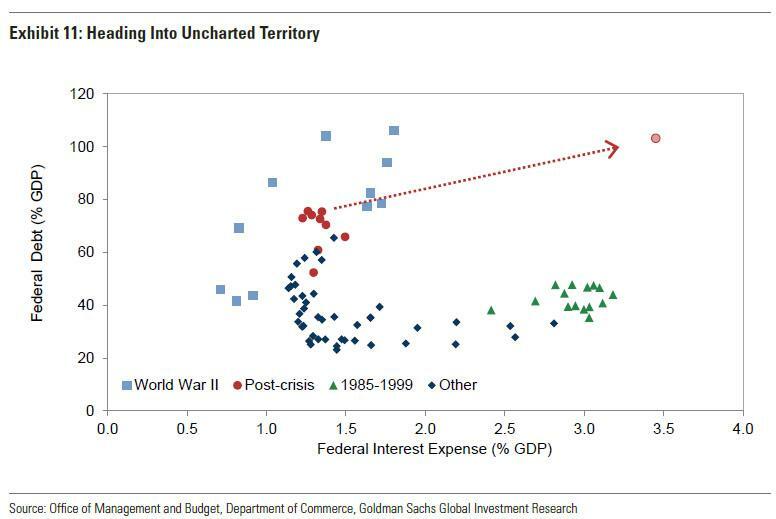 Goldman, focuses on "the beginning" part, and notes that "An expanding deficit and debt level is likely to put upward pressure on interest rates, expanding the deficit further." Building on our recent work on deficits and interest rates, our baseline scenario suggests that the widening of the deficit from 3.5% to 5% of GDP should boost 10-year yields by 30bp, other things equal, while our forecast of a chronic deficit in the range of 6-7% of GDP in the next decade would imply a cumulative boost of around 70bp over time. Of course, before everyone panic sells their duration exposure, Goldman has one big caveat: "whether such an interest rate move occurs depends in part on if market participants believe lawmakers would allow such a fiscal outcome." The problem, as Phillips conclude, "while Congress will eventually address the widening budget gap, it also seems quite likely to take longer than most market participants might expect." Eventually, lawmakers are likely to become more sensitive to the fiscal situation and will take action to reduce the budget deficit. However, this doesn’t seem likely in the near-term, for at least two reasons. First, we will soon enter the period in the political cycle where deficit reduction measures are less common. Deficit reduction legislation is more common at the start of the four-year political cycle (1990, 1993, and 1997 marked the major deficit reduction packages of the 1990s for example) than just before a presidential election. Admittedly, the 2011 Budget Control Act that introduced the current spending caps stands as at least one exception to this pattern. Nevertheless, the odds of meaningful deficit reduction policies seem likely to decline further as the 2020 presidential election approaches. Second, there is less political consensus than usual regarding the need for reform. Only 2-3% of the public in recent polling cite the deficit as one of the most important problems facing the government, compared with levels of 15-20% during the fiscal battles of the mid-1990s or the 2011-2013 period. This could change if political leaders increase their focus on the issue, as they did during those earlier periods. However, it seems unlikely that Congress will reverse any of the recently enacted tax cuts or discretionary spending increases, which leaves entitlement spending as the only area of the budget where fiscal consolidation seems plausible over the next few years. However, the Trump Administration has not made this a priority—the President opposed cutting Medicare and Social Security spending in the 2016 campaign, though the most recent White House budget proposed modest savings in these areas—and one of the chief proponents of entitlement reform in Congress, Speaker Paul Ryan, is retiring from Congress at year end. Deficit reduction proposals do not seem likely to figure prominently in 2018 midterm election campaigns and, at least at this early stage, do not seem likely to become an important issue in the 2020 election either. This suggests that the fiscal outlook is unlikely to change substantially due to policy actions until at least 2021, leaving it dependent largely on the path of the economy until then. Said otherwise: with the 10Y now well north of 3.00%, Goldman newly reconstituted prop trading desk is buying all the paper its clients wish to sell. Trade accordingly.